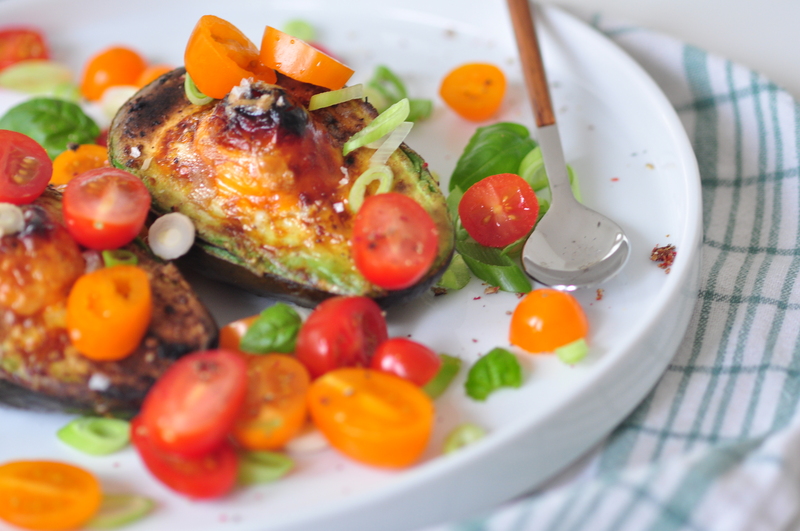 Did you ever try avocado baked in the oven? It get’s a complete different taste when warm, actually it reminds me about baked potatoes. This recipe is all over internet with different temperatures, time and tip for what to combine it with. This is my version. I hope you will give it a try, it is really good! Start with setting the temperature on the oven. Cut the avocado in two and take out the kernel. Pour just a small splash olive oil over the green surface of the avocado and sprinkle some salt and pepper. Place the avocado in a tray. Separate the egg (keep the egg white for another time) and add the egg yolks to each half of the avocado. When the oven is warm enough, place the tray with the avocado in the oven. Set the timer for 12 minutes. While the avocado is in the oven, prepare your greens to go with it. Cut the tomatoes and spring union in thin slices. Take out the avocado when ready. Add your greens, basil, the olive oil and vinegar. Sprinkle some salt and pepper on top. Enjoy! If you are meat-eater, baked bacon or chorizo works really well with it as well.